My dad and I have been running together on and off for years. We’ve got a similar pace and amount of endurance. We’ve run a handful of 5Ks – not competitively like many runners though. Just for ourselves. I’m not even sure what our records are. Over the weekend in Roanoke, we ran in the annual St. Patrick’s Day 5K in downtown Roanoke to support Roanoke Catholic Schools. It’s not a hard course overall – paved, with a very slight uphill for the first half, then back down the second half. But then comes the last two minutes or so of your run where you’re faced with a giant set of three hills. Up, up and up. And up some more. My dad pushed me to keep going, to make it under 35 minutes. And we did, crossing the line at 34:56. But man, it was rough at the end. Pollen filled the air and eventually my throat and lungs. But we kept up our slow but steady pace throughout the race that has grown tremendously since we ran it five years ago. Once we crossed the finish line though, the water table had run out of cups. No cups!? I needed water! Desperately. I was having a mini breathing attack, something that unfortunately happens when I get my heart rate up that high. But we grabbed a gallon jug with a few inches of water remaining and kept that for ourselves as we walked around to cool down. Overall, it was fun, and I’m glad we got to run together again. It’s been awhile – just one run over the winter together. 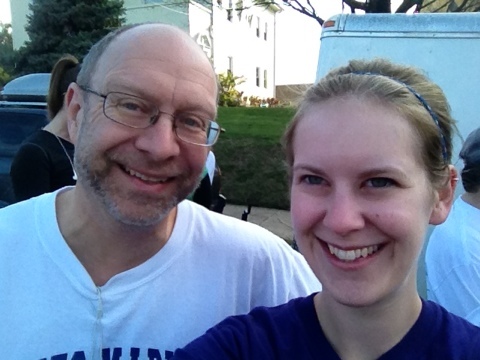 My dad’s been running regularly, much more than I have been. Though I do keep trying. Stupid night meetings!